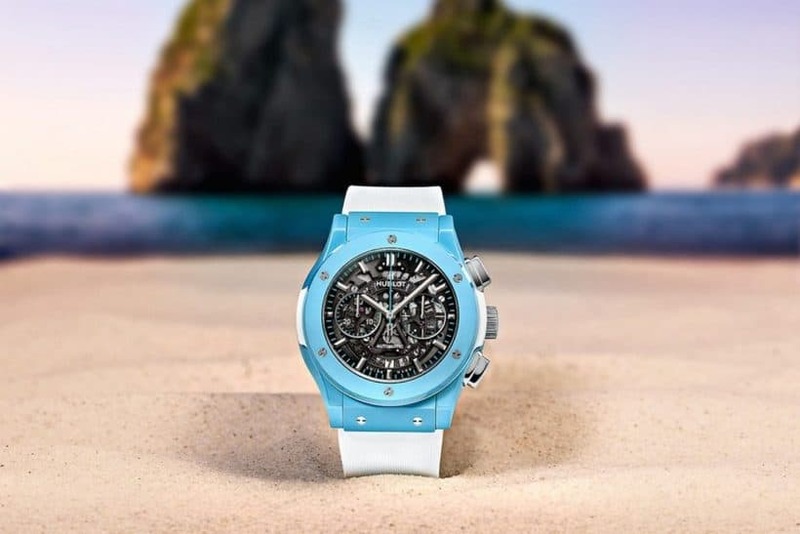 Hublot’s exclusive boutique in Capri has been welcoming tourists on the island’s famed Via Vittorio Emanuele for a year now – that calls for a celebration, right? 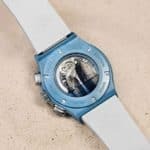 The renowned Swiss watchmaker has recently unveiled a special watch inspired by Capri’s sheer beauty, that was called the Hublot Classic Fusion Aerofusion Chronograph Capri. 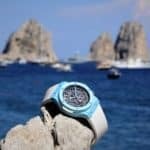 Produced in a limited run of just 30 units, this gorgeous timepiece was designed with Capri’s spectacular Faraglioni or its wonderful “Blue Grotto” in mind, a magical place where the water takes a bright electric blue color – hence the beautiful case of this watch. 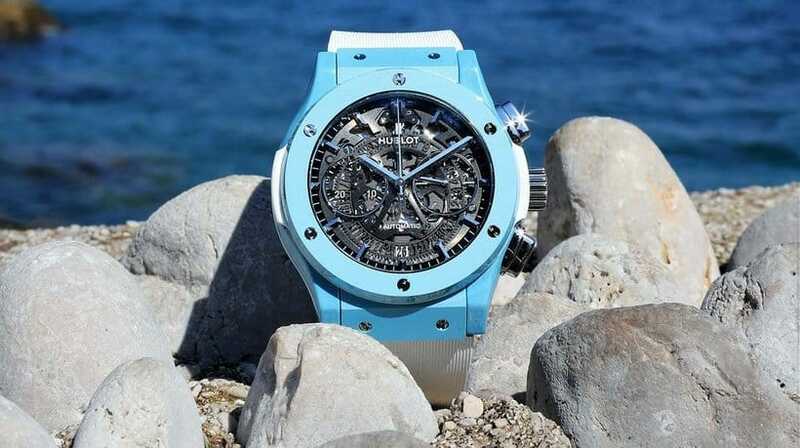 I’m not easily impressed by special edition watches, but this beauty makes me daydream about the good life in Italy. The Aerofusion Chonograph Capri shows off a stunning, 45 mm, polished and satin-finished turquoise ceramic case that stands out even more thanks to its white rubber striped strap. 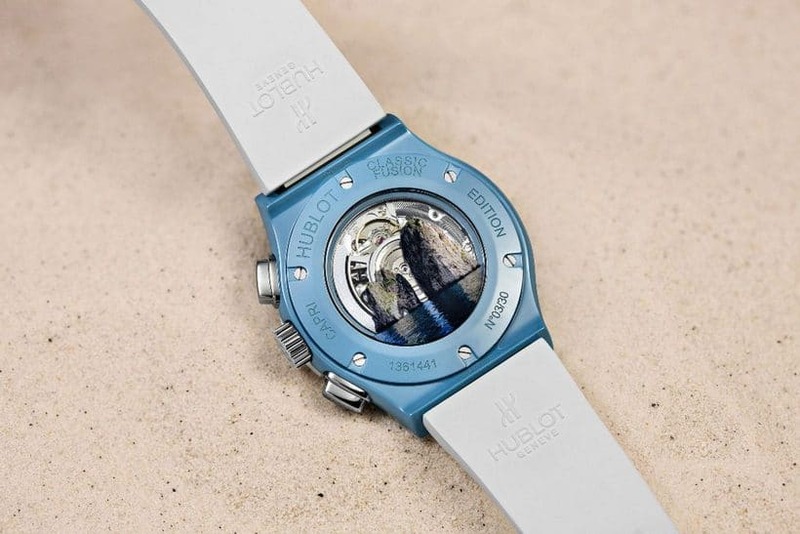 The lovely turquoise shade of the case was inspired by the calm waters of the Gulf of Naples, but the real tribute to the unique charm of Capri is hidden on the case back, where you could get a glimpse of the Faraglioni. Inside, the HUB1155 self-winding chronograph movement powers everything up, with 42 hours of power reserve, and the dial features many other turquoise elements that will charm everyone. 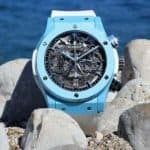 If you want to leave Capri with a unique souvenir, Hublot’s newest timepiece might be the best thing you could buy.